$2 1/2 Gold pieces or Quarter Eagles were made from 1796 through 1929. Most dates before 1834 are very rare and are seldom seen by the public. The types most often found are the Coronet Liberty Head type made from 1840 through 1907, and the Indian Head type made from 1908 through 1929. 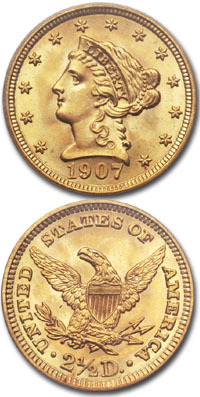 The Liberty Head series contains many rare dates prior to 1895. Most of the mintages were very low and many coins were lost due to remelting. 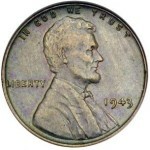 The most commonly found coins are dated after 1895 and are worth about $275 in average condition. 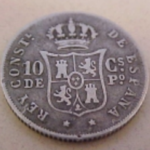 The mintmark, if any, is just below the eagle on the reverse. The Indian Head Quarter Eagle is one of only two U. S. coins with the design cut into the surface of the coin rather than raised above it. 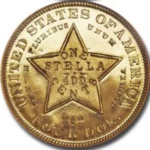 This unusual minting process is known asincuse and is shared by only one other coin, the Indian Head $5 gold piece. Because of the unique design, the mint mark on the Indian Quarter Eagle is the only part of the design raised above the surface. 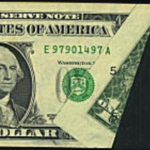 The mintmark can be found on the reverse at approximately seven o’clock, just in front of the bundle of arrows upon which the eagle is perched. The Indian Head series contains only one rare date, the 1911-D, which is worth $2500 or more. The rest of the dates are relatively common and are worth only about $250. There are many counterfeits in existence, particularly of the 1911-D. Usually a “D” is added to a genuine 1911. On a genuine 1911-D, the mintmark is usually weakly struck. To be certain your 1911-D is genuine, you should have it authenticated and graded by a third party grading service, such as the Numismatic Guaranty Corporation (NGC) or Professional Coin Grading Service (PCGS). 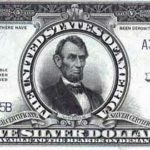 You may submit coins directly to NGC if you are a member of the American Numismatic Association (ANA) or to PCGS if you join the PCGS Collector’s Club. You may also submit your coins through an authorized dealer.